Does the thought of Christmas shopping bring you out in hives? As much as it’s a time of happiness and joy, the gift-buying element leaves some of us feeling distinctly unfestive. 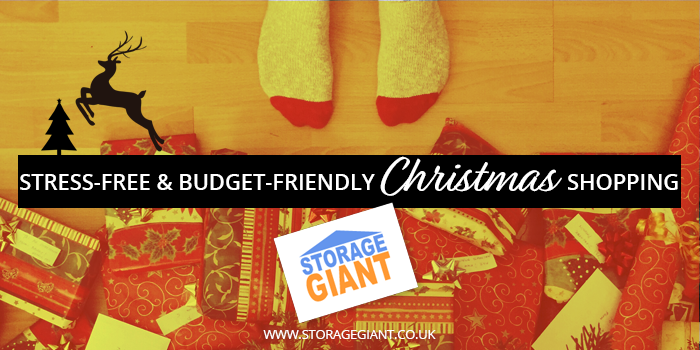 However, fear not, Storage Giant have the perfect formula for stress-free Christmas shopping. Santa let us in on his secret, and we’ve got it on good authority that it’s a combination of solid research, a set-in stone budget and perfect timing. Follow our guide below to arm yourself with spot-on gifts in the stress-free way! Is your daughter demanding an upgrade to a newer version of her mobile phone (thanks, Apple) while the current one still works perfectly? Does your husband feels like he urgently needs a new set of gardening equipment (although the last time you’ve seen him in the garden was summer last year while taking a nap on the hammock)? Before you proceed with your family wish list, think twice if they really need the gifts requested. On many occasions, you might find out that the more expensive wishes could wait until another special occasion such as birthday, when you’ll be able to join the forces with the other family members and collect more money. Remember that old, family photo album that you put into storage? Christmas is the ideal time to revisit family heirlooms and sentimental items so you can find a perfect gift that will please both younger and older generations. Family heritage such as your great grandfather’s trumpet would make a great under-tree present for an aspiring young musician, while a classic photo album filled with childhood and more recent photographs will bring back memories to your parents. And you don’t have to spend a penny! If you’re in rush and feel like running around the overcrowded shops isn’t really your thing, then online shopping is a great solution. With a wide range of deals available (think Black Friday and Cyber Monday), you can shop the quality gifts in the comfort of your own home. Need some inspiration? While many people seem to be put off from shopping online as it’s difficult to get inspired when you can’t peruse what’s available in person, you can effortlessly tackle this issue by setting yourself up a Pinterest board. By creating one, you can easily browse the ideas from people around the globe, and you can either ‘pin’ them for later or shop straight away. Want one more tip? Before purchasing anything online, make sure you run a quick search and check comparison websites to make sure it isn’t offered cheaper elsewhere. Making a last-gasp dash to the shops this Christmas Eve? Stop the clocks! Last minute shopping is often cited as the primary reason for unwanted Christmas gifts. Here’s why – shopping for pressies while in rush is just like grocery shopping when you’re hungry; there is more than 99% chance that you will end up with the things you don’t want and spend much more than planned. To avoid this sort of situation, make sure that you plan your shopping day before you go. Set a budget and stick to it (take the right amount of cash instead of using your credit card). It’s also worth spending some time researching beforehand, planning the shops you want to go to and preparing a list of ideas prior to embarking on your trip. Hand-made, personalised treats usually make a big impact. After all, the best thing that you can offer to your family or friends it’s your own time. How about embroidered handkerchiefs, homemade chocolates or a brownie or hot chocolate mix jar? 6. How to Handle Unwanted Gifts? Just got another board game you don’t really want or a book you’ve already read ages ago? If hinting to your mother doesn’t work and there is no way you can exchange your gifts, why not pop it into storage, away from the prying eyes of curious family members – and, who knows, maybe in 5-10 years the gift you didn’t really need would make a perfect under-tree treat for a younger generation?